Addison’s disease (hypoadrenocorticism) is a hormonal disorder that is caused by a deficient production of the adrenal gland hormones, cortisol and aldosterone. 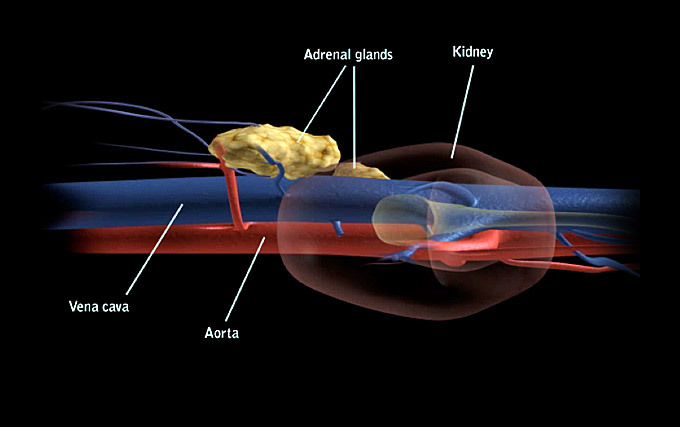 The adrenal glands are two small glands located next to your dog’s kidneys. The glands help regulate several bodily functions and are responsible for the production of cortisol and aldosterone. Cortisol is a steroid that helps your dog combat stress, while aldosterone helps regulate the water and electrolytes in her body. A deficiency of these two hormones is referred to as hypoadrenocorticism, or Addison's disease. There are two types of Addison's disease, referred to as primary and secondary Addison's disease. Primary Addison’s disease is the most common form; it may be futher subdivided into typical and atypical disease. The primary type of Addison’s is a result of your dog’s own immune system destroying the adrenal gland itself. Why this happens is unknown (idiopathic). Certain medications, toxins, cancer, or concurrent disease are less common causes of primary hypoadrenocorticism. Addison's disease may also result when the drug used to treat Cushing's syndrome destroys too much of the adrenal tissues, resulting in a deficiency of cortisol and aldosterone. Secondary Addison's disease results from a problem, such as a tumor, in the pituitary gland, which is an important hormonal regulator located in the brain. Secondary Addison's disease can also develop if your dog has been treated with long-term steroids for any reason and the medication is abruptly stopped. Sometimes, Addison’s disease can manifest in a much more serious form. If your dog suddenly becomes weak with severe vomiting and diarrhea, or collapses, contact your veterinarian immediately! Your veterinarian will perform a complete physical exam and take a thorough history of your pooch. Most likely, diagnostic tests will be recommended to identify the cause of your dog’s illness, especially since her symptoms could be the result of so many different conditions. If your dog has been diagnosed with Addison’s disease, she can most likely be treated successfully with oral medication. Your dog's diet and activity levels can often remain unchanged and she can live a normal life, even after an Addisonian crisis. Your veterinarian will want to watch your dog’s progress carefully, particularly at the start of treatment. This may involve occasional hospitalization for monitoring and follow-up testing. If your dog is diagnosed with Addison’s, she may need to be on a lifelong replacement of both cortisol and aldosterone. Stressful situations such as boarding, traveling, or surgery may require that some medications, such as cortisol, be increased. Your veterinarian will want to see your dog on a regular basis to ensure that she’s stable doing well on her medication. If adjustments to her medication are necessary, your veterinarian will make them, accordingly. This usually involves simple follow-up blood and urine tests. The prognosis for most dogs diagnosed with Addison’s disease is good to excellent, once a diagnosis has been made and they have begun a medication regimen that helps stabilize their hormone levels.